When presented with a challenge, Lennard van der Feltz is never one to shy away. It’s this philosophy, combined with his entrepreneurial spirit that led him to establish Pinnacle Financial Advisors with co-founder Susan Talbott. In his role, Lennard delivers creative financial solutions to Pinnacle Financial Advisors’ clients with unique planning challenges. 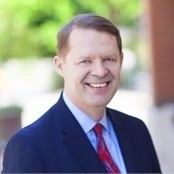 With more than three decades of experience in the business world, holding positions in business operations and information technology, he has dedicated nearly half of that time to the craft of financial planning, specializing in investment and insurance optimization for tax efficiency, as well as unique challenges of clients’ international portfolios. His foray into financial planning was part of Thrivent Financial, a financial services provider. It inspired him to form Pinnacle Financial Advisors, which brings together a talented multi-disciplinary team of financial experts who deliver unrivaled value and results to individuals, families and businesses. Operating without constraining corporate restrictions, Pinnacle Financial Advisors is rooted in trust and transparency. Lennard leads his team to deliver comprehensive financial roadmap development and implementation using a wide range of financial products and services that are unparalleled in the industry. Under his guidance, Pinnacle Financial Advisors’ planning strategies are customized to clients’ risk tolerance, life stage, goals, desire for involvement, asset level, tax sensitivity, and investment experience. Lennard is known in the industry for blending his business and finance acumen with a fervent interest in technology and the supporting role it plays in helping clients achieve their short- and long-term goals. His belief in holistic planning and exploring every avenue comes from a career focused on uncovering opportunities, evaluating efficiencies, and exploring greatest returns. Prior to Pinnacle Financial Advisors, Lennard started his career at Exxon as an international auditor, analyzing business operations and controls in Paris and Rome. This is where his inherent need to problem-solve was born. Although fascinated by peoples’ decision-making processes, his passion in technology was ferociously ignited when the firm introduced its first personal computer system. It led him to TEAMS International (Team Evaluation and Management Systems), the developer of 360-degree job evaluation processes, where he served as Vice-President of Technology. He went on to found KnowledgeTrax, a business development planning and technology consulting firm. Lennard is a CERTIFIED FINANCIAL PLANNER™ professional, holds his FINRA Series 7 and 66 securities licenses, and is a member of the Financial Planning Association Phoenix Chapter. He holds Life and Health Insurance and Variable Life and Variable Annuity licenses in Arizona, California, Kansas, Minnesota, Oregon, Texas, and Wisconsin. His impressive education background began in The Netherlands at Nyenrode Business University where he developed statistical analysis software. Subsequently, he attended Washburn University in Kansas where he graduated with a Bachelor of Business Administration in General Business. From there, he pursued an advanced degree at the prestigious Thunderbird School of Global Management, earning a Master of Business Administration in International Finance and Operations. As well, Lennard completed a Master of Science in Management in Decision Information Systems from Arizona State University’s W.P. Carey School of Business with an emphasis on artificial intelligence and problem structuring. Lennard lives in Tempe with his wife Cheri. They have four children. Outside of the office, he enjoys learning about computer systems and networks, traveling, reading, music, and movies.